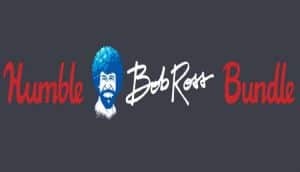 Humble Bob Ross Bundle Goes Live | Nerd Much? Perhaps the happiest painter alive is helping to bring smiles to faces in a new way. Humble Bundle has announced the Humble Bob Ross Bundle has gone live. The Humble Bob Ross Bundle, as you might imagine, is an artistically oriented bundle of games and other items within the Humble Bundle program. For the $1 minimum, you get six Bob Ross approved things. Three of which are episodes from his iconic painting show, Joy of Painting. The bundle includes the episodes “A Walk in the Woods” (Season 1, Episode 1), “Mystic Mountain” (Season 20, Episode 1) and “Island in the Wilderness” (Season 29, Episode 1). The other three items are art inspired games. For $1 you’ll get Crayon Physics Deluxe, Draw a Stickman: Epic Collector Pack, and Draw Your Game. However, if you pay more than the average (currently just over $5), you get much more. Three e-Books are thrown in from Ross’ Joy of Painting collection. As well as the games Passpartout: The Starving Artist and Drawful 2. You’ll also earn a 50% discount on the Jackbox Party Pack 4. If you splurge on the Humble Bob Ross Bundle and spend more than $15, you’ll get yourself a digital art suite to play around with. The art program Corel Painter Essentials 6 is included as well as the Bob Ross-inspired Mystic Mountain Essentials Brush Pack. Humble Bundle says that all of these item combined would amount to $187. So if any of this catches your eye you’re getting a hell of a deal. The proceeds from the Humble Bob Ross Bundle are divvied out between the developers and the World Land Trust rainforest conservation charity. However you can also choose your own specific charity to donate to if you so wish. The Humble Bob Ross Bundle is an excellent, affordable, and quirky way to get tools into fledgling artists’ hands. And, of course, it all goes towards a great cause. Humble Bundle is an affiliate of Nerd Much, LLC. Any purchase may result in Nerdmuch.com receiving a small commission.